The leaders of the USSR had diverse culinary tastes with Lenin preferring simple food, Stalin craving brandy and Khrushchev enjoying a good steak. Vladimir Lenin was politically savvy, but a complete amateur in the kitchen. In her memoirs, his wife and comrade-in-arms Nadezhda Krupskaya almost never described family meals as "lunch" or "dinner," but usually used the Russian pitaniye that is more commonly associated with hospital food and diets, or even kormezhka, which is usually used when speaking about pets. "Lenin not only didn't notice what he ate, but even when he was asked directly whether he liked something, he just couldn't give an intelligible answer," writes Russian culinary historian Vilyam Pokhlebkin in his article "What Did Lenin Eat?" Lenin's contemporaries noted that his only culinary passion was a mug of good beer. The great Bolshevik was born and raised on the Volga where they still brew Zhigulyovskoe beer, which is famous throughout Russia, and he spent many years in exile in Germany, as well as spells in Britain and Switzerland, so he knew a good beer. Joseph Stalin didn't stick to Lenin's maxims when it came to food. In Georgia, where he was born and where his tastes were formed, they have very rich culinary traditions. Famous Georgian wines, sweets made from dried fruit, pickled cheese, spicy and savoury soups, chicken, beef and lamb dishes – all these diverse delicacies made the Georgian dining table a holiday feast. Stalin didn't forget about these meals during the years he worked as an underground revolutionary in foreign lands. Later, when he was exiled to Siberia, he sampled Russian cuisine too, especially fish-based dishes. The Siberian waterways produce highly sought-after varieties of fish in abundance, so even those in exile could afford soup made from the prized Russian nelma (freshwater whitefish). Many years later, members of the Communist elite permitted to eat with Stalin recalled how they initially turned up their noses at stroganina (a kind of Siberian carpaccio) made from nelma, but then tried it. Needless to say, during the years of Stalin's rule, nelma was delivered fresh to the Kremlin on a special flight. Stalin had two requirements. First, the waiters didn't wait on the guests, but brought the first and second courses, appetisers, and desserts to the table, then left. Affairs of state were discussed at the table and eavesdroppers were not welcome in the dining room. Each of the high ranking guests even had to step up and serve himself the first course – either shchi (soup made from fresh cabbage or sauerkraut) or kharcho (Caucasian spicy stew made from lamb, rice and tomatoes). Stalin’s second idiosyncrasy was that there had to be more than ten varieties of vodka and brandy on hand, including the famous Kizlyar that Stalin personally sent Churchill. The ruler of the USSR himself drank moderately, and always preferred Tsinandali and Teliani, white and red wines from the Kakheti region of Georgia that were made by a different method than European wines. Among fruits, Stalin loved bananas best of all – the most exotic fruit available in the Soviet Union in those days. Nikita Khrushchev, who denounced the cult of Stalin, didn't care much for fruit, even exotic kinds. He wasn't even that crazy about eating corn, which he demanded be planted on a quarter of all arable land in the USSR after a trip to the United States during which he admired the achievements of American agriculture. Corn was grown primarily to feed livestock in the hope that the country would soon see the end of its meat shortages. Meat, it turns out, was Krushchev's weakness. "We made a lot of different dishes from meat," recalls Khrushchev's personal chef Anna Dyshkant. "Meat with mushrooms, meat with prunes sweet and sour. He was very fond of tenderloin. We made it for him in a special way. We poured oil in the pan, then soaked up some with a cloth so that the pan was half-dry. We tenderised the meat and fried it. It turned out like a very tasty steak." Nikita loved pirogues just as much (similar to raviolis, but with a vegetarian filling). He preferred them with sauerkraut and onions, cottage cheese and sour cream, or potatoes and cherries. 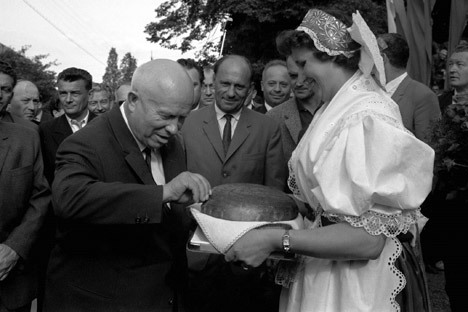 But Khrushchev's favorite treat was a hunter's kulesh – a very filling Cossack dish of millet and pork fat that is a cross between a nourishing soup and stew. The hospitable host liked to brag about this dish in front of guests, according to Dyshkant's memoirs. Cakes for the Khrushchevs were ordered in the Kremlin, which had a special bakery for that purpose. In the culinary history of Russia's elite, the Brezhnev era is known for the lobster soup that was revived by the Kremlin chef. This was an old Russian dish that was often served before the revolution in upper class Russian homes, but then was completely forgotten. The soup is somewhat similar to the famous Mediterranean roux, but has its own particulars. It is fairly easy to cook, you just need to crack 20 live, large crayfish. They are gently boiled in a light fish broth, the tender meat is removed from the necks and claws, and the shells are fried. The fried shell is finely ground and sautéed in a small amount of melted butter. Then this sauce and the meat are added to the broth and brought to a boil. Black pepper, bay leaves and dill are added to taste, and you have the favorite dish of the person who ushered in the era of stagnation in the Soviet Union. One of Brezhnev's passions was hunting. "Every Thursday after Politburo meetings he invited comrades to go hunting. Sometimes the meetings lasted only forty minutes," recalled KGB Major General Mikhail Dokuchaev in an interview with Komsomolskaya Pravda. "Each hunter was given a small case that held 250ml of brandy and sandwiches." The Soviet president especially loved porridge, and a royal assortment was offered to him. "Buckwheat, pearl barley, whole grain barley ... He especially liked pearl barley from real grain," continued Galkin. "It had to be cooked for eight hours, but it was worth it. We made him buckwheat in different ways, as a gruel or fluffy, with mushrooms, bacon ... Sometimes he asked for rice or millet porridge." The Gorbachevs ate high-calorie or rich meals only on festive occasions. Then chefs prepared lamb, wild game, sturgeon and bester (a hybrid of two species of sturgeon) baked in champagne. But even during these feasts the Gorbachevs didn't want to see the table crammed with delicacies. Today Gorbachev, who is undergoing treatment in Germany, has a much more modest diet on the recommendations of a doctor.